BMO Online Inventory Management System is able to manage your stock requests regardless which branch your staffs are stationed. When your staffs receives low stock level alerts, they can submit stock request via the online POS system. From the “Item” tab, you can check your stock request list. 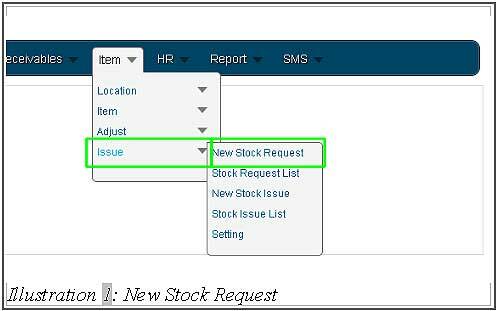 In this tutorial, you can create a new stock request in BMO Online Inventory Management System by following the steps as shown below. 1. Click on “New Stock Request” (Item > Issue > New Stock Request) on the navigation menu bar. 2. Go to “Stock Request Info” and you will be able to see “Stk Request No.” , the number for stock request. You can leave it as default (it will generate the next number in sequence) or key in the numbers manually. In addition to that, you can change the date by clicking on “Calendar Icon” or type in your own. The “Description” is optional, whether to write or not. Next, selecting the location through “From Location” and “To Location”. This is to determine the location of the stock that will be sent to. 3. Go to “Item List” and click on “…” button to browse for the item. After selecting the item, you can click on “Add Item” button to add the item into the list. On the item list, you can add “Remark” to the item, e.g, item size is big, need bigger truck to transport. 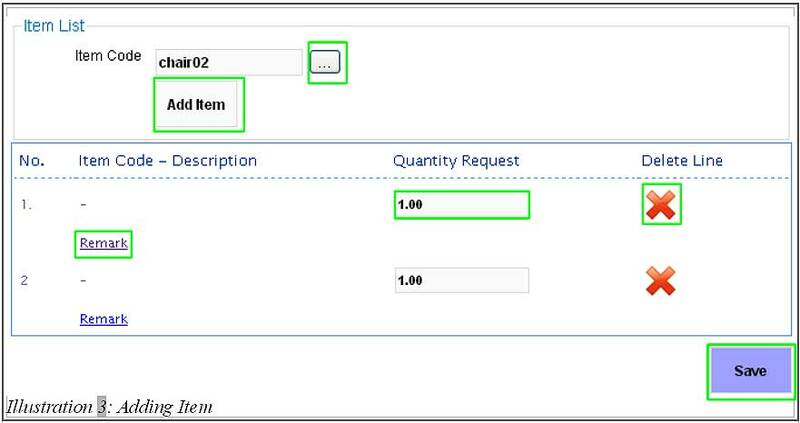 On top of that, you can add the quantity at “Quantity Request” or delete the item by clicking on the “X” icon. Lastly click on “Save” to save your Stock Request. 4. A window will pop up after user clicked save. Click “OK” to dismiss message and continue. The new stock request entry will be added into the stock request listing.